Does your business need raw materials? Entrepreneurs, are you looking for inspiration? The [Re]verse Pitch Competition is awarding $10,000 to the best repurposing business ideas. Come to Opening Night on February 26th to learn about the products, meet the material suppliers, and network with fellow entrepreneurs. During the opening pitch event, you'll hear from businesses and institutions consistently generating or collecting by-product, surplus or otherwise underutilized materials streams in Austin, Texas that could be put to higher and better use in new social enterprises. Join us at Hops & Grain to celebrate another year of successful waste diversion! 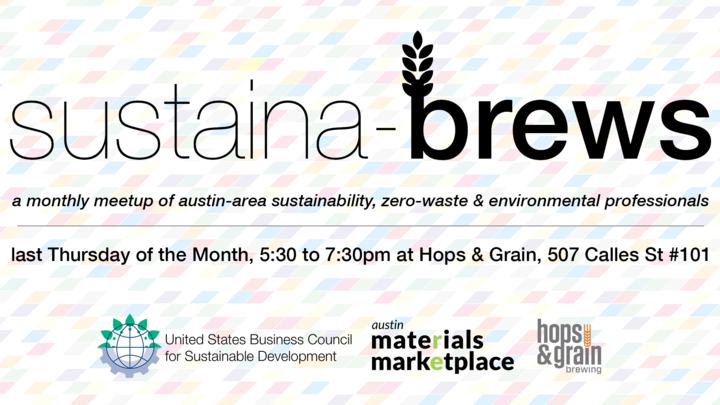 Come on out Thursday, November 29th to toast our impact in 2018, network with other Austin Materials Marketplace participants, and learn about our new platform and program updates in the pipeline for next year. Join STAR Central Texas for a tour of Still Austin—a local whiskey distillery and tasting room that has embraced zero waste and sustainability. You’ll learn about how the company is diverting their by-products from the landfill, investing in local grains and biodiversity, and reducing their water and energy use. After the tour, stick around to meet fellow recycling and zero waste professionals and enthusiasts in Central Texas. If small talk with a room of people you don’t know sounds intimidating, don’t fret! We’ll be facilitating networking exercise designed to help you meet people and quickly find ways you can help each other out or work together. Libraries have been bringing reuse to communities big and small since the time of Ben Franklin by allowing neighbors to share books, media, and knowledge. But libraries can help us share much more than that! 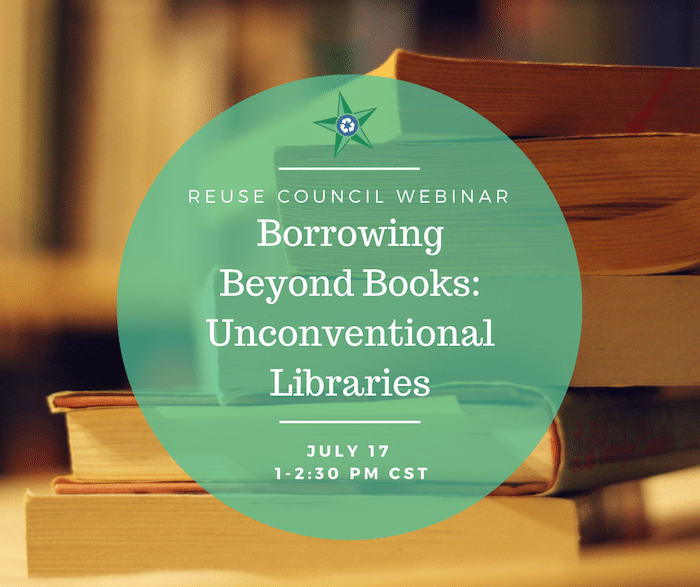 Join the Reuse Council for a webinar featuring creative libraries that are enabling the reuse of unconventional items like tools, seeds, and clothing. Speaker details coming soon. Register to listen in here! Clean Energy Beers is held on the first Monday of every month after work at Uncle Billy’s Brew & Que. Clean Energy Beers started off in April 2009 as an informal extension of Dr. Michael Webber’s office hours at U.T., and has evolved into a regular gathering of those interested and involved in cleantech. Five years later, the monthly tradition is still going strong. At the final event, the [Re]Verse Pitch finalists compete to see which repurposing business ideas will receive an Innovation Prize to start the new venture. This event is free and open to the public, but your RSVP is requested. Parking will be available at the City Hall garage. Light refreshments will be served. Join us for a day of information sharing and partnership building to help support the growth and expansion of recycling/composting opportunities around the Central Texas area. Cost: $25 including Eventbrite fees. There are sponsorship opportunities availible, if you would like to sponsor contact STAR to support this event. What: This year’s forum focuses on the concept of improving composting in Texas. This is an opportunity to learn about city curbside composting programs, commercial composting systems and businesses that are working to close the food waste loop. After a networking lunch, attendees will have the chance to participate in active learning workshops and hear panel presentations. Join the Reuse Council for a webinar on materials exchanges: how they work, what challenges they face, and the successes they've achieved. You'll hear from small-scale to state-wide exchange operators working across a variety of material and resource types. Speakers will join us from the US Business Council for Sustainable Development (that's us! ), the City of Houston's Reuse Warehouse, and Sourcewater. Interested in educational, professional development, networking and advocacy opportunities to promote reuse? Join forces with the Reuse Council for our bi-weekly calls and quarterly events. Email reusecouncilstar@gmail.com to receive more information. Entrepreneurs are used to pitching their business idea to investors, partners, and anyone they might share an elevator ride with. In this competition, the tables will turn. The [Re]Verse Pitch Competition is a social innovation program to help turn valuable raw materials that are currently leaving local businesses, non-profits, and institutions as waste into the raw materials for new or expanding social enterprises. Competitors work with mentors & advisors to develop repurposing business ideas and compete for Innovation Prizes to help start this new venture. During the opening pitch event, you will hear from businesses and institutions consistently generating or collecting by-product, surplus or otherwise underutilized materials streams in Austin, Texas that could be put to higher and better use. Come to learn more about these products, meet the material generators, and network with other [Re]verse Pitch participants. This event is free and open to the public, but your RSVP is requested. Attendance is mandatory to compete for an Innovation Prize. The Universal Recycling Ordinance now affects all commercial and multi-family properties. This means that all businesses must have recycling services - a huge leap for getting Austin businesses to send their wastes to a higher and better use than the landfill. Learn about how the URO affects your business at one of these free trainings. The ARR team will even help you complete your required annual diversion report! Get inspired, connected, and ready for the third annual [Re]Verse Pitch Competition at our fall kick-off event. What do a husband and wife entrepreneur team building houses in Huntsville, TX and a Fortune 500 company have in common? A dedication to the circular economy. This event will feature a joint keynote address from two ends of the business spectrum: a small home builder and a multinational technology company. Before and after listening to these world-class speakers, you will have time to network with [Re]Verse Pitch mentors, past participants, and staff. 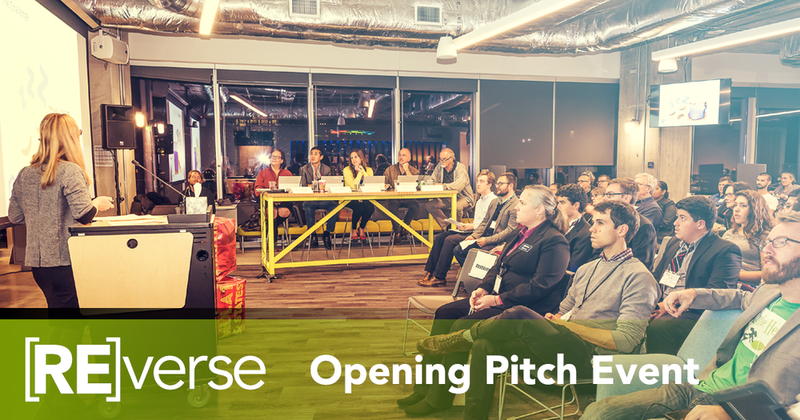 We will also provide an overview of the [Re]Verse Pitch Competition and staff will be on hand to answer questions. Light refreshments will be served. 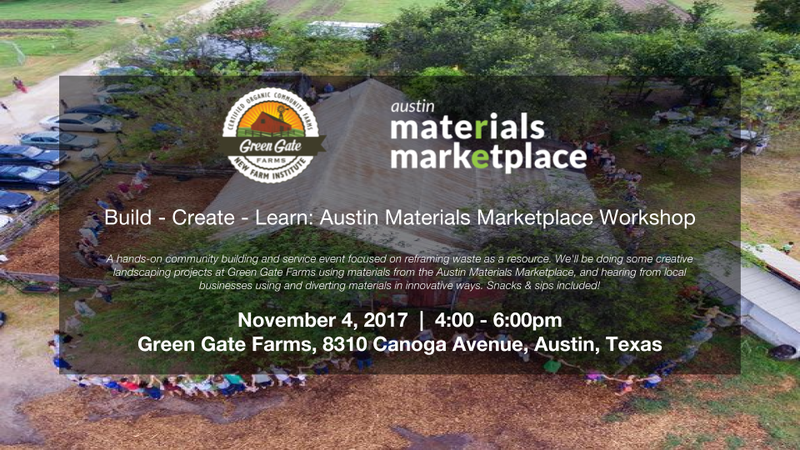 The new Materials Marketplace platform for the Austin Materials Marketplace program was launched in July 2017 and incorporates a wide range of new features. In this webinar on August 10th at noon we will present a demo of the platform, and review its user interface and new elements to help you gain a better understanding of how it all works. At the end of the webinar, we’ll answer any questions in a Q&A session. We know that Reuse is one of the R’s and has a place above Recycling on the waste hierarchy, but what does the business of reuse look like? What are the successful reuse business models beyond the traditional thrift or resale operation? Speakers will share leading national models for making reuse work for the bottom line through creative repurposing, repair, resale, and remanufacturing. Register to hear how these organizations bring in revenue, control costs, create partnerships, and compete in the marketplace to make reuse financially sustainable. Click here to register.